A few weeks ago I had a misshap while playing tennis: I lunged for a ball, felt a pop in my right calf, fell, and limped off the court trying to convince myself that I’d simply pulled a muscle. But after several days of dragging my leg around like a piece of lumber, I was forced to confront the reality that it was something more serious—an instinct confirmed by several professionals (first a podiatrist, then an orthopedist), both of whom immediately diagnosed the problem as a tear in my Achilles’ tendon. Naturally this has put a major crimp in my summer plans. Aside from the things that must now be eliminated from my activities list (swimming, running, and riding my bike to name a few), what with the ensuing doctors visits, equipment hunting (for crutches and for the Darth Vadar-like boot I’ve been wearing this past week), and all the arrangement-making (phone-calls, paperwork, more paperwork, more phone-calls) associated with the surgery I must now undergo to repair the problem, the news has pretty much sucked up every waking minute. 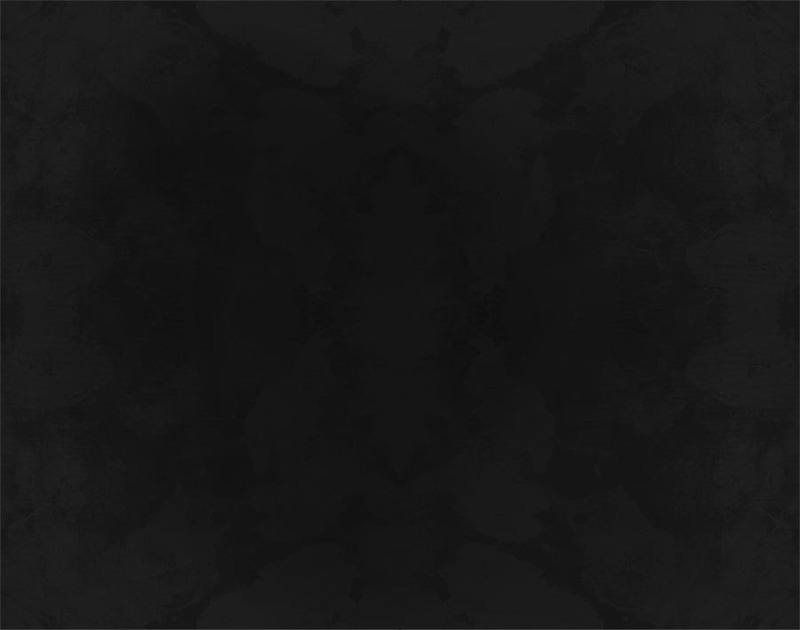 It’s been a frustrating experience to say the least, and although I’m trying not to get dragged down by self-pity (people deal with so much worse, I know), I won’t pretend this hasn’t been a massive headache, or that I’m not dreading the months of healing and physical therapy that lie ahead. But there you go—that’s life. 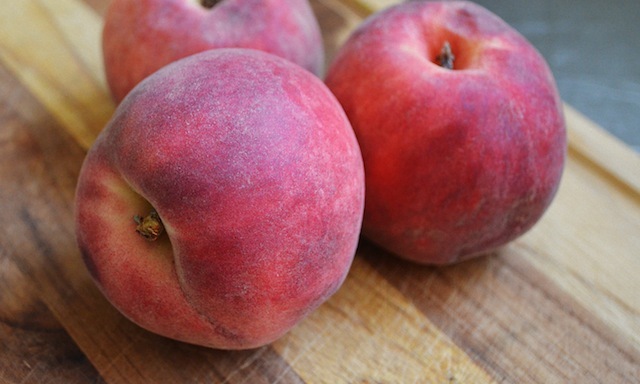 And in the meantime, there are still lots of things to be happy about… like sweet summer peaches for one. I’m not kidding. 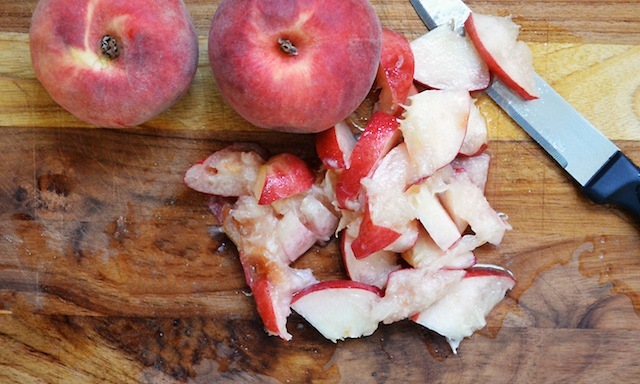 A truly sweet, juicy peach is one of the very best things about summer—and also, at least in my experience, one of the most elusive. Which is why when I went to the market in search of the ingredients for those brown butter pistachio financiers I keep mentioning and caught of whiff of the fragrant white peaches piled in the produce section, it prompted an immediate change of plans. (A good peach can do that—and should.) Of course, it didn’t hurt that I also had a recipe for peach olive oil cake that I’d been wanting to try, or that it came from the same individual who’d written that financier recipe I’ve been so obsessed with—namely Kristen Kish, the chef de cuisine at Menton in Boston, and the winner of Top Chef Season 10 (both recipes can be found in the June issue of Food and Wine). 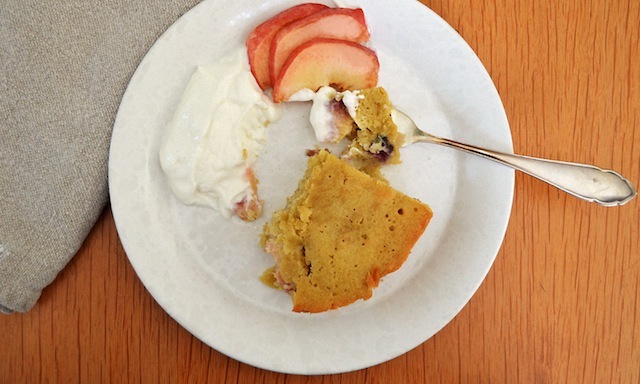 In fact the recipe is a riff on the dessert that helped Kish win the cooking competition in the first place, though simplified so the cake is one any home chef can assemble in just thirty minutes or so. That was certainly one of the appealing things to me about the recipe, which sounded as enticing as it did straightforward. And I was intrigued by its being an olive oil cake, something I’d never made before and that I’d long been curious about—specifically how the earthy quality of the oil merges with the various other ingredients (in this case flour, sugar, and peaches) so that the end result still lands squarely in the dessert category. In fact, as I got busy making the cake and tossed the sliced peaches with their ¼ cup of olive oil (along with some sugar and a small amount of salt), and then whisked the eggs with their 1¼ cups of olive oil (and still more sugar) I began to wonder if this was even a possibility, especially since my samplings of both the peach and the egg mixtures presented a flavor that was decidedly olive oil-like. 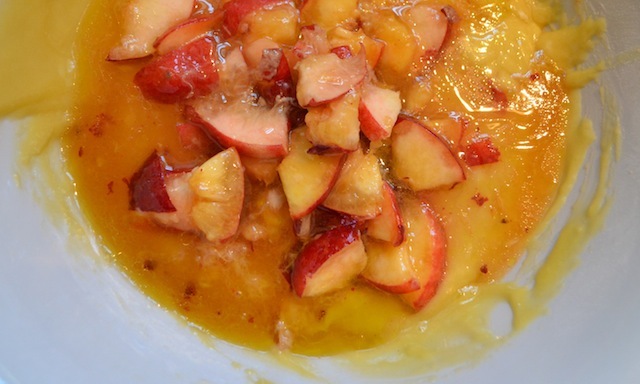 Maybe once the flour mixture is added to the egg the flavors will balance out, I mused, but no—even in its thicker, more batter-like state, and even after the peaches had also been added, the olive oil was still the dominant flavor. 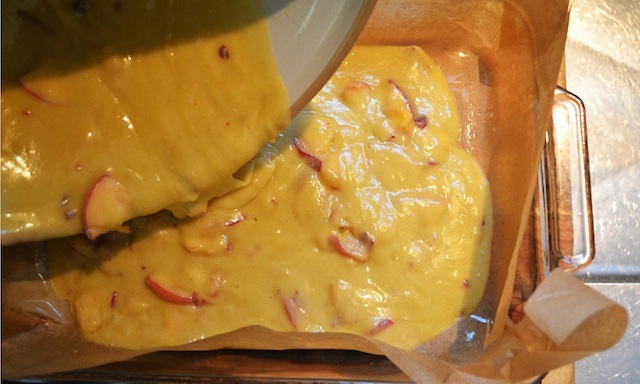 But with nothing to lose except a half hour of my time and three extraordinary peaches, I proceeded with the recipe anyway, transferring the combined egg, flour, and peach mixture into the prepared pan, and sliding it into a 350˚ oven for 35 minutes or so. 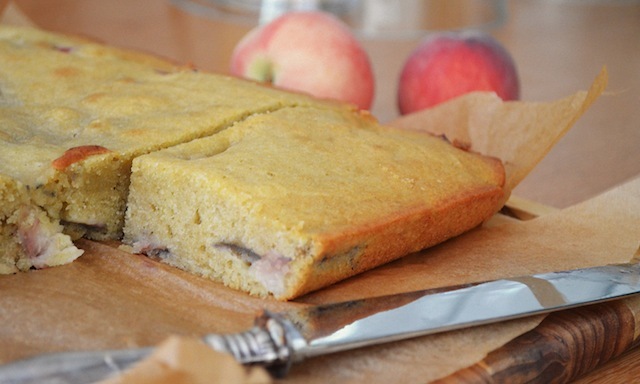 Miraculously, however, during its relatively short stay in the oven, the cake not only took on a beautiful golden hue (similar, in fact, to the skin of a ripe peach) but the grassy flavor of the oil disappeared entirely, replaced by the subtly powerful perfume of the fruit—essence of peach, if you will. 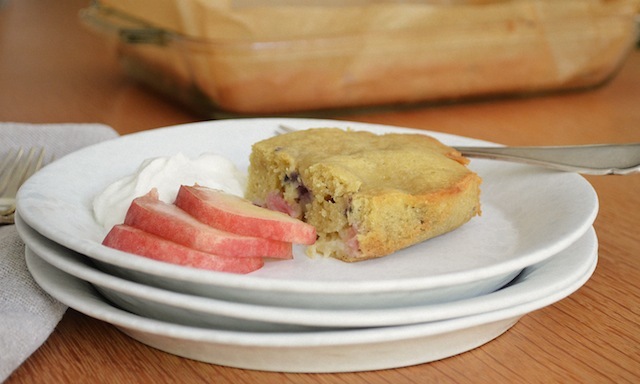 What’s more, the oil transformed the cake itself into something dense, moist, and pudding-like. In a word, delicious. Served with a dollop of Greek yogurt (Kirsh suggests sweetened vanilla, but I found the tang of the unsweetened variety to be the perfect accompaniment) and a few additional peach slices tossed with a little sugar and allowed to sit for a few minutes, it’s everything you could ask for in a summertime dessert. But like summer, the pleasures here are ones that must be enjoyed at once, ideally while the cake is still warm. In fact, a return visit to the finished cake the next day revealed it to be a little soggy in spots, and a little dry in others. I’m sure there’s some clichéd metaphor in all this about the importance of enjoying summer while you can. But let’s skip all that and instead just close by saying: Make this cake, and devour it at once! —Perheat the oven to 350˚. 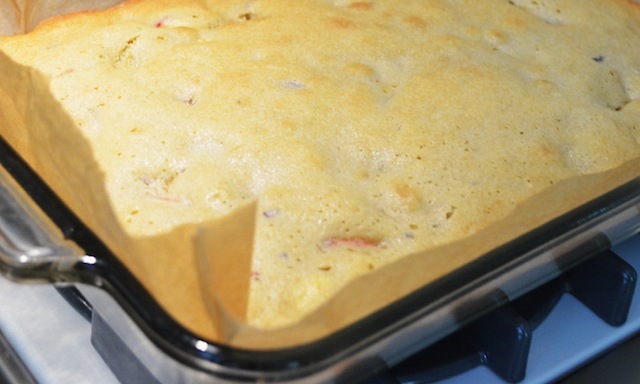 Line a 9-by-13-inch baking pan with parchment paper and coat with vegetable oil spray. 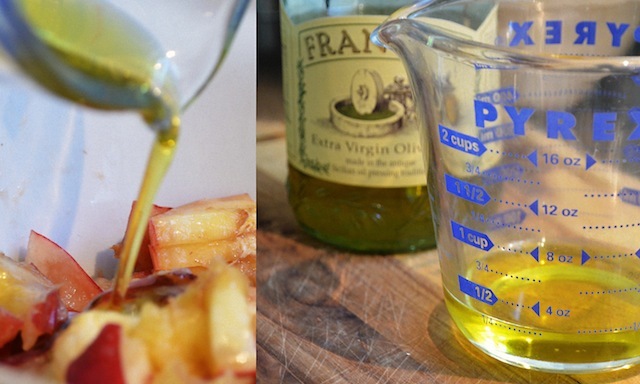 —In a bowl, toss the peaches with a ¼ cup of the olive oil, ¼ cup plus 2 tbs of the sugar, and the salt. Let stand until juicy, about 15 minutes. 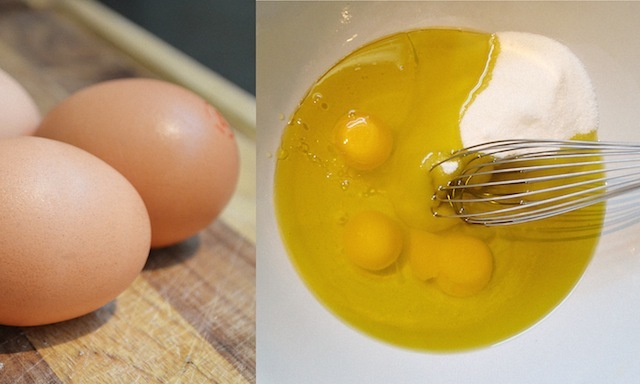 —In a bowl, whisk the eggs, the remaining ¾ cup of sugar and 1¼ cups of olive oil. 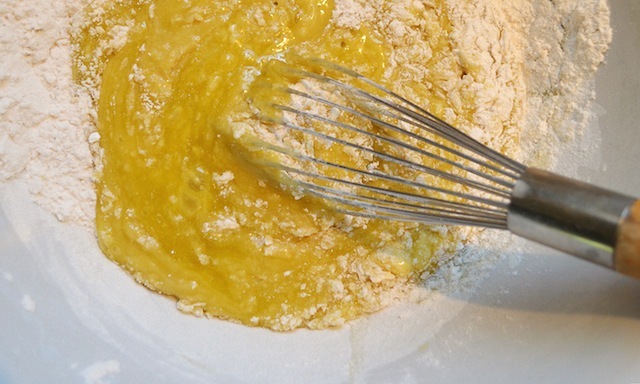 —In another bowl, whisk the flour, baking powder, and baking soda. Whisk the dry ingredients into the egg mixture. 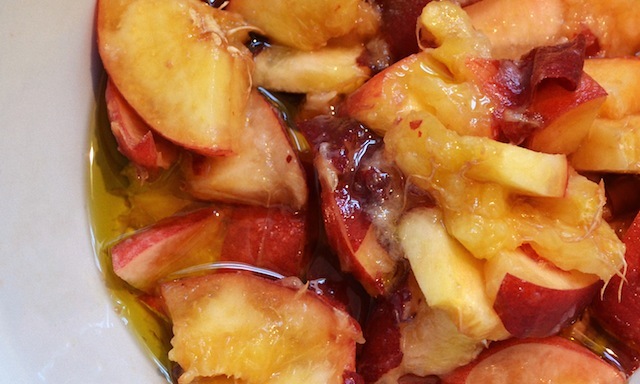 Fold in the peaches and juices. —Scrape the batter into the pan; bake for 35 minutes, until golden and a toothpick inserted into the center comes out clean. —Let cool slightly, then serve with Greek yogurt.